Frankly, when it is cold outside, it is also cold inside. I remember living in Phoenix and the air conditioner ran 23 hours and 45 minutes every day. No matter what you set the thermostat, the ambient air was still hot. That goes for cold too. I feel sorry for all of you on the east coast. I remember those cold days and don't regret living in southern California. I went from Akron, Ohio to Phoenix, Arizona to San Diego, California. Frankly, the first two were a little too extreme for me. When I saw this knit scarf, I remembered a time when I was doing some temporary work locally. Since they were having me doing all that typing for just a few weeks, they sat me in a corner where the air conditioning was really, really cold. I wore 2 sweatshirts and a blazer and still had numb fingers within 30 minutes. I thought that this scarf would have been a terrific fashion statement and ward off a lot of cold air. I often find that, with my age in consideration, having a little something on my back and neck helps keep me warm. 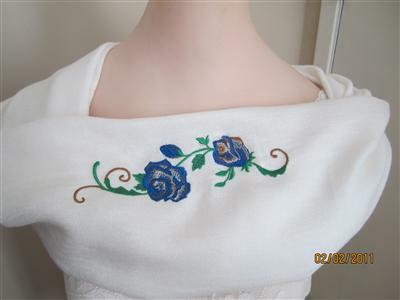 It is really so simple that I made it in 2 hours and that included the embroidery, which was nearly 35 minutes. 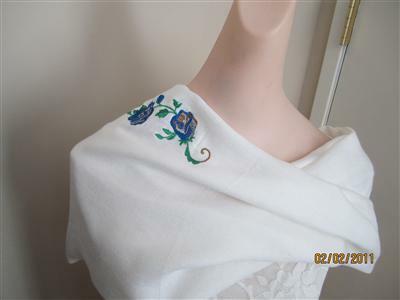 Deborah Jones, The Embroidery Mentor who also blogs for AnnTheGran has her method for hooping knits. Deborah recommends that you use a cutaway stabilizer and IMHO, AnnTheGran has the best of the best stabilizers with a very low price when you are an Ann's Club member. The pattern called for a piece of knit 31" by 41" and I had a scrap of fabric that was just a little over that size. I did, however, cut it down to size. 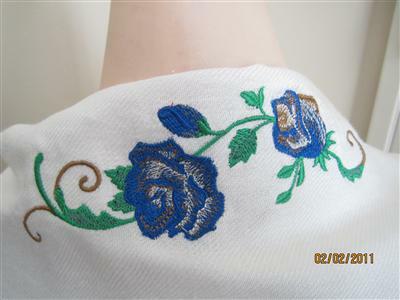 I took the fabric and determined the center of both sides and placed a rose motif on it. I thought it would be a nice touch because my fabric is white. 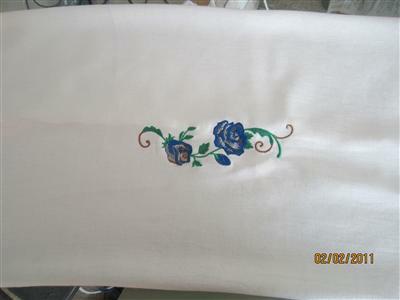 After embroidering, I folded the fabric in half lengthwise and sewed a seam. 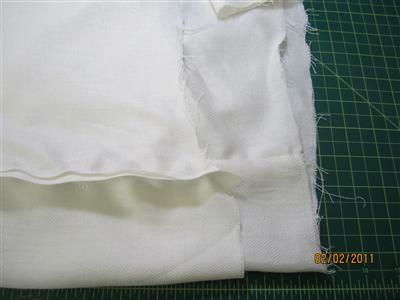 Then I turned it right side out and making a 'fold back' or cuff. 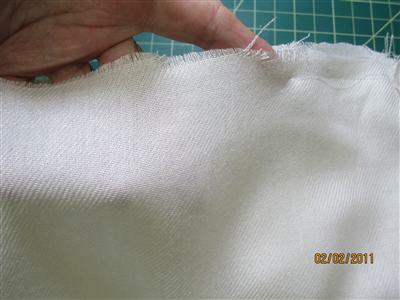 With the short ends aligned, I pinned and sewed that end, leaving a few inches to enable me to turn it all around. Of course, it was time to sew up that small opening and I had a terrific scarf that looks like a Cowl Neck! This is on the back of the neck where drafts can be really chilling. This won't slip off either. A great look around your winter coat, especially if it could use a little TLC! A wonderful place to put endless hooping designs. 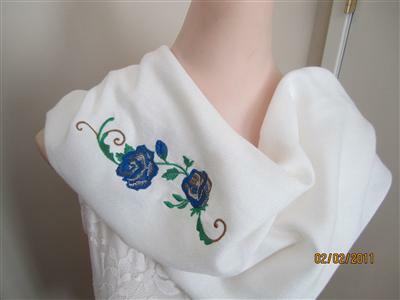 This would be wonderful with a Monogram that would be 'sitting' on the shoulder. You can increase or decrease the size easily. How terrific would using something like organza with this one? Or even a fake fur fabric? Won't this be a wonderful item for Mother's Day Giving? I used a light weight fabric creating a draping effect. If you use a heavier fabric like a winter knit, it will have even more definition. I hope you like it, I sure do. Since this one is so quick, easy and inexpensive, you can make them for many occasions. Elegant and comfortable -- a win, win! Nice Scarf! I willl have to make a few and see if helps or at least I will look nice trying! Thank you for the post and pictures. Denise ( who is not to far from Akron, Ohio.